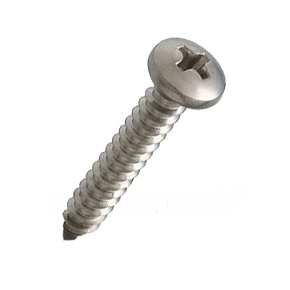 304 Stainless Steel Pan Head Screw with Phillips Drive, Sharp Point. For sheet metal or wood. Point: Sharp Type A point. Sizes: Available in #4 from 1/2 to 3/4", #6 from 1 to 2", #8 sizes from 3/8 to 3", #10 sizes from 3/8 to 3", #12 sizes from 1/2 to 3", #14 sizes from 1/2 to 3".